This dish came about when I paired leftover sauce from Sweet Potato Salad with Soy-Ginger Dressing and Peanuts with soba noodles. Since then I've tinkered with the recipe, adding spinach and tofu to the mix. 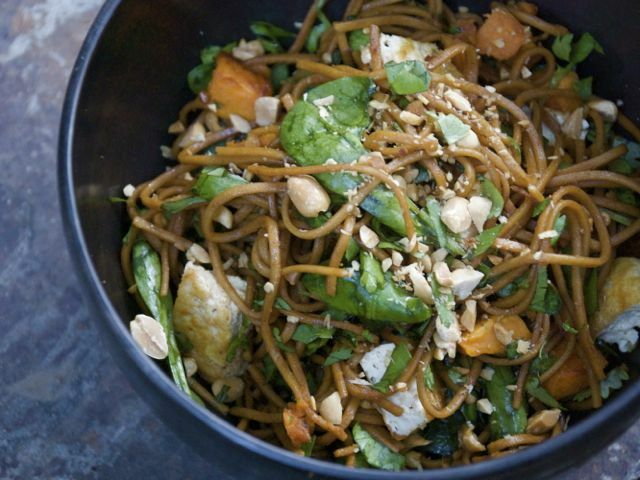 Though there are multiple steps to preparing these noodles — roasting the sweet potatoes, frying the tofu, making the sauce — it yields a tasty and filling meal-in-a-bowl full of nutritious ingredients. Make the sauce: In a medium bowl, place all the sauce ingredients. Whisk until smooth and set aside. Roast the sweet potatoes: On a large baking sheet, pour enough oil to create a thin film. Place the sweet-potato cubes on the pan, cover with a big pinch of salt, toss to coat with the oil, then spread out in a single layer. Roast the sweet potatoes in the preheated oven for 15 to 20 minutes, stirring after 10 minutes, until cooked through and light brown. Remove from oven and set aside. Prepare the tofu: Use paper towels to pat the tofu block dry. Cut the block into 4 strips lengthwise, then cut into cubes. Blot with paper towels again, to remove any moisture from the surface. In a large skillet, pour enough oil to come up in the pan a quarter-inch. Heat the oil over medium-high heat. Once the oil is hot, add the tofu cubes carefully, as the oil will sputter. Fry the tofu until light golden brown, turning to brown all the sides, about 10 minutes. Drain the tofu on paper towels and sprinkle with salt. Cook the noodles: Prepare noodles according to package instructions. Drain, then place in a large bowl and toss with sauce. Add the roasted sweet potatoes, spinach, fried tofu, and half the chopped peanuts; toss. Season to taste with salt. Serve: Sprinkle the remaining chopped peanuts over the top of the noodles. Serve warm or at room temperature with the optional lime wedges, for squeezing over the noodles.